Kevin Garnett was the NBA's most revolutionary player since Michael Jordan, changing the league both on and off the court. Years from now, when basketball fans look back, Kevin Garnett will be remembered as an extremely high-functioning crazy person. This is the correct historical reading. His relentless approach to everything was every bit as ridiculous as his talent. It's what set him apart from everyone else. His stat lines rivaled those of Tim Duncan, but KG's numbers came with chest pounding, trash talk, laughing, dunking, and more trash talk. He was as loud as Duncan was quiet. Nobody who watched this will ever forget it. After they remember his persona, people will obviously talk about his game. His skills were probably 10 or 15 years ahead of his time, but he was so good that he dominated the 2000s anyway. 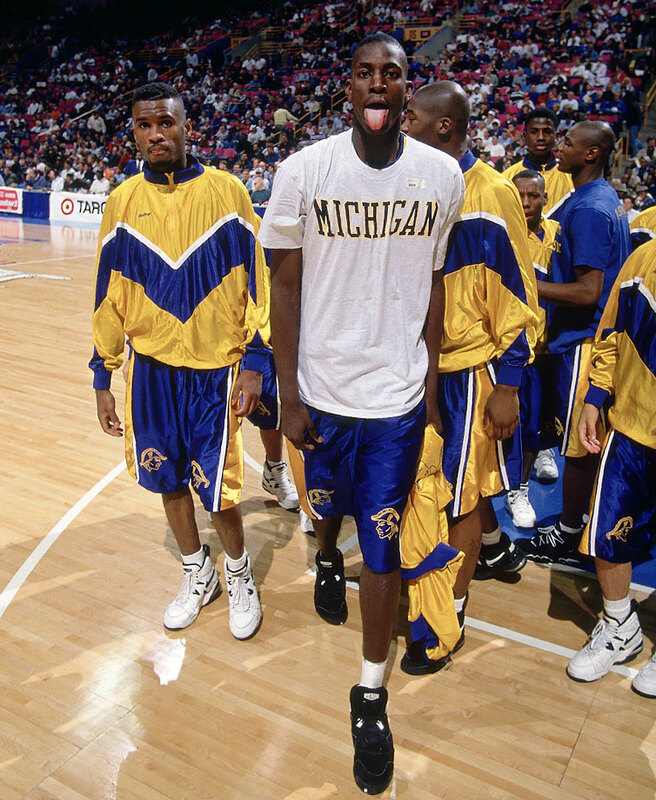 Imagine Draymond Green, but five inches taller, and better at every phase of the game. That was KG. I'll remember his commercials. My top five: 5) The Celtics and SportsCenter, 4) Foosball with Brandi Chastain, 3) Carrying the whole world on his back, 2) Interrogating Cherokee Parks with the Fun Police, 1) Tastefully Done. While we're talking old YouTube videos ... Garnett also gave us the greatest post-championship interview ever, the greatest sideline interview ever, and an interview before Game 7 that made the entire country uncomfortable. It was all part of the experience. 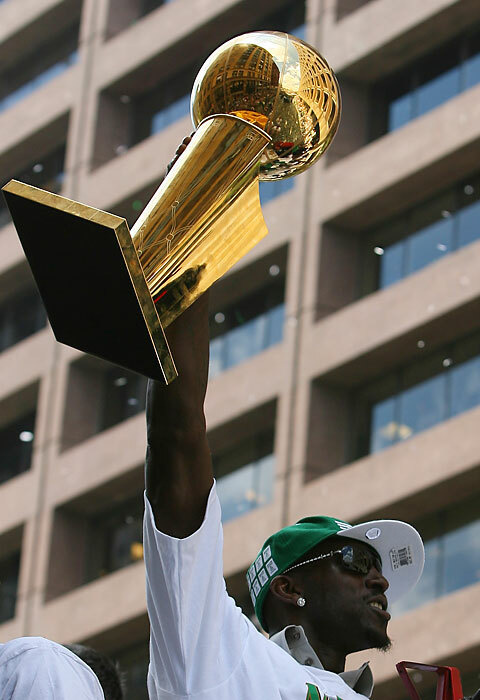 Some athletes mesmerize you with numbers or highlights, but with KG, it was more amazing that he could exist at all. That much height with that much skill... It didn't seem like his skillset should be possible, and there was no way playing that hard could ever be sustainable. But it was. Garnett played 21 years, scored 25,000 points, got his ring, and finished his career where he started, mentoring a superstar who wasn't even born during KG's rookie year. If he's really retiring now, there's just one more thing to say: Garnett was the most influential NBA player since Michael Jordan. 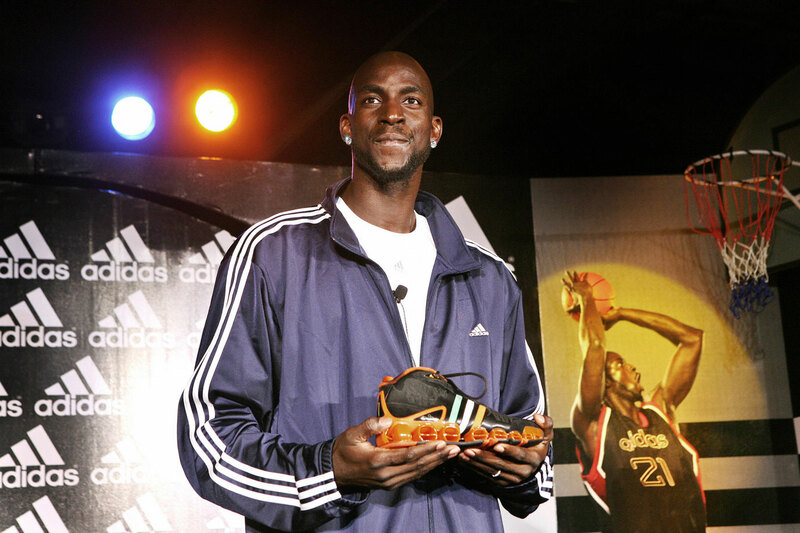 He leaves basketball with the highest career earnings of all time, and historians would have an easier time cataloging the crucial elements of the basketball business KG didn't upend. Start with the draft. Garnett was the first high school player to enter the NBA in decades, but that's only the beginning. Even after the NBA closed the preps-to-pros door that Garnett opened, his impact remains. 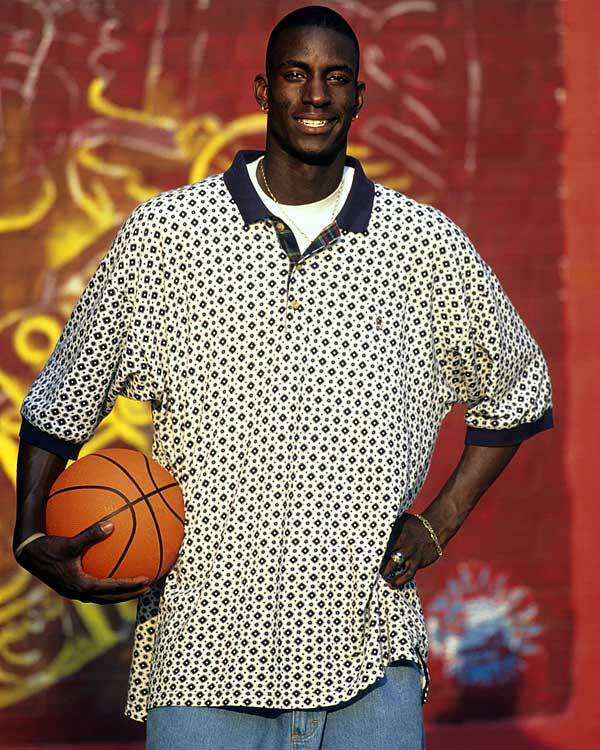 Every time an NBA team drafts a spindly teenager who's nowhere near ready to play in the NBA, that's KG. Anytime you hear analysts talking themselves into a 7'1 kid with the rough outlines of perimeter skills and a theoretical place in the paint, again, that's a Big Ticket tribute. There have been dozens of mysterious lottery picks over the years—from Jonathan Bender to Dragan —that happened basically because teams were terrified of passing on another Kevin Garnett. And for every teenage bust, there have been stories like LeBron, or Carmelo, or Anthony Davis, or Karl-Anthony Towns, all players who changed entire franchises. KG showed the league the power of potential. Then, the contract. 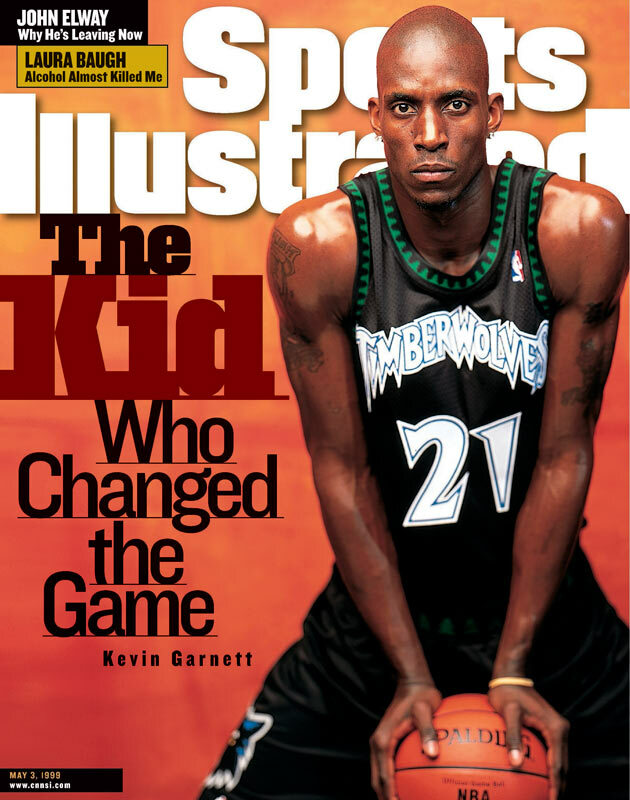 This Sports Illustrated cover speaks to the shockwaves that KG's first Wolves extension sent through the league. He signed for six years and $126 million, a record at the time that ultimately spearheaded the NBA lockout. "I'll kill you before I let you take of advantage of me," he told SI's Leigh Montville at the time in 1999. He was talking about signing an agent in that case, but his negotiating philosophy clearly extended to the Wolves as well. He's often credited with forcing the NBA to adopt the max contract system, but that's not quite it. The NBA would've pushed for that regardless. It was bigger than a max deal. KG didn't only show teams that potential has value in the draft; he also showed future young players that their potential has superstar value on the open market. It was deeply polarizing at the time. Now, the Pelicans commit $127 million to Anthony Davis and nobody bats an eye. There was his actual game, too. Everything that "superstar power forward" would come to mean in the modern era—including the ability to play as the lone big man in small lineups—Garnett was doing 15 years ago (The Ringer's Jonathan Tjarks wrote about this over the summer). He showed that a big man who could excel in space could be twice as dangerous as one who lived in the post. When future fours followed his lead, it opened up offenses all over the league. 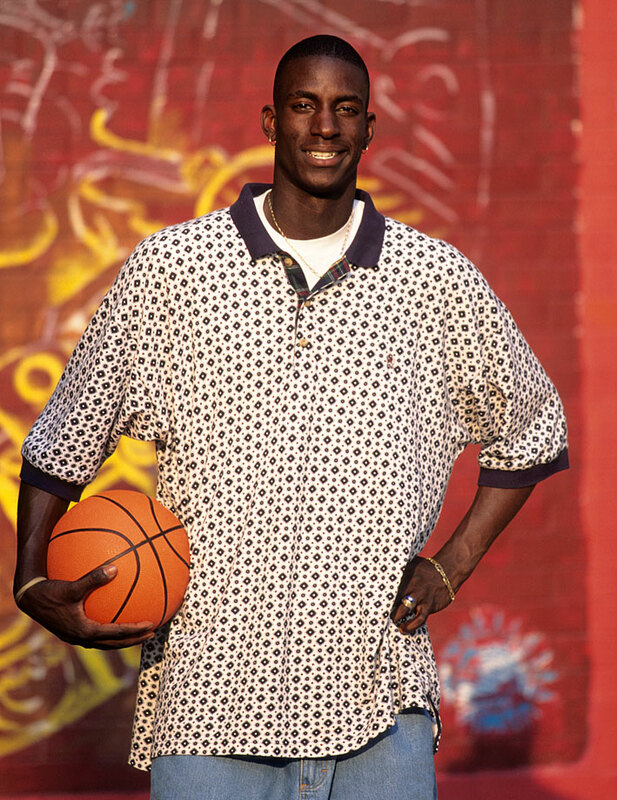 The entire sport is played differently thanks in large part to players who grew up watching KG and mimicked his skills. His defense was so legendary and relentless that it didn't actually revolutionize much—it's hard to replicate Hall of Fame talent—but his combinaition of skills and size was everything. He became a prototype that teams have been chasing for the past 20 years. And superteams. KG's most recent impact on the league is probably his most notable at this point. The rise of the '08 Celtics established a new blueprint for superstars who'd been stranded in dysfunctional organizations across the league. KG waited longer than most others have—he was in Minnesota 12 years before he left—but still, the success of Ubuntu clearly laid the foundation for everything we've seen since. There were two elements to the shift across the league. One was philosophical—players realized it wasn't a crime to seek out great players as teammates—and the other was practical—those Celtics teams (and eventually the Heat, now the Cavs and Warriors) were so good that other players realized they'd need help to have a shot at competing. Having said all this, most basketball fans probably won't remember Kevin Garnett for revolutionizing the NBA, partly because he's never played that part in public. Through everything, he's never claimed to care about anything more than destroying people on the basketball court. Plus, as legacy discussions go, it's more fun to remember him screaming his way through the NBA for the past 20 years. This is fine. 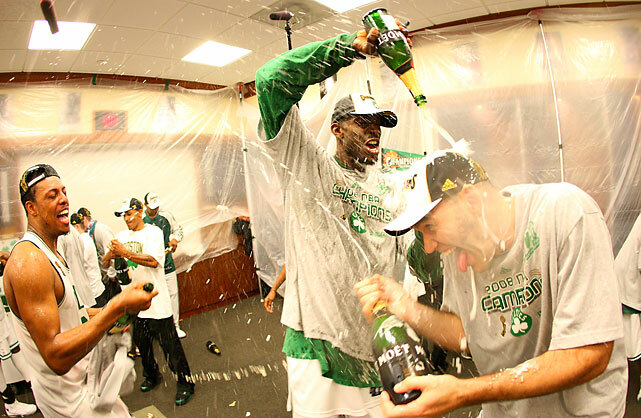 LeBron can be the revolutionary everyone celebrates. He's courted that reputation, and he deserves it. But what happened with KG might be more remarkable. He first considered the NBA out of high school because his college eligibility was in doubt (his SAT scores would've qualified, but he didn't find out until after the draft). He asked for $126 million because the Wolves had no choice but to pay him. He played power forward the way he did only because his freakish frame and skills made it possible, and he was too skinny to spend his whole career banging with Shaq. He went to the Celtics not to spawn a new NBA era, but because he desperately wanted a real chance at a title. It was all the happiest, craziest accident. LeBron and Jordan have been incredible because they each knew exactly what they were doing as they reshaped the NBA universe. KG was incredible because he remained indifferent to revolutions for his entire career, and he changed everything anyway. * Editor’s Note: Kevin Garnett announced his retirement from the NBA after 21 seasons on Friday. You can read more about his storied NBA career in the SI Vault and his unbreakable bond with Kendrick Perkins. Kevin Garnett retired Kevin Garnett's 2015 return to the Minnesota Timberwolves was an effort to rectify a strained relationship. The best player in franchise history had left on complicated terms after a trying, 12-year stay culminated in anger and frustration. Some tellings of his exit point to team owner Glen Taylor's refusal to give Garnett, then 31, the three-year, $60 million extension he had pushed for. “If he wanted $12 million, $12 million and $12 million instead, I would have signed him," Taylor said then. Garnett received just such an extension from the Celtics after being traded in 2007. At his introductory press conference, Garnett was quick to characterize his ideological rift with Wolves' ownership and management. "The more I continued to talk to Minnesota about the future ... it contradicted how I saw it, or what I thought was best for making the team better," Garnett said. 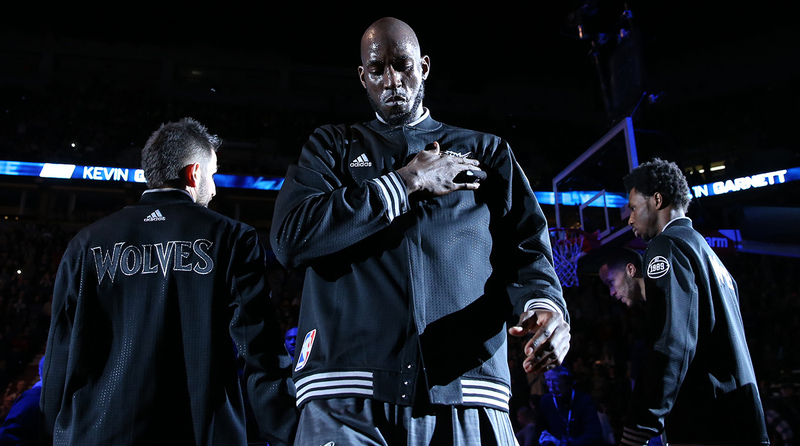 KG may never have wanted to leave Minneapolis in the first place. And while he wanted to stay on his own terms with the full clout of a superstar, it was made clear that he didn't have much interest in playing for the kind of developing outfit the Timberwolves were looking to build. 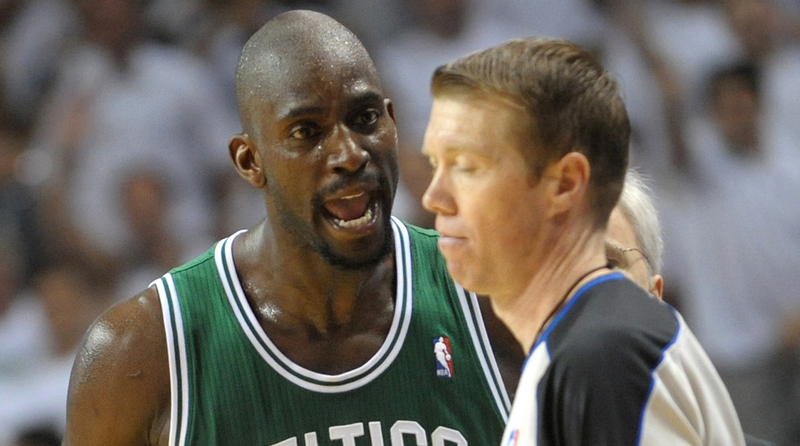 "At this point in my career," Garnett said, "I can't do young." For years Garnett drew a hard distinction in his Minnesota associations. 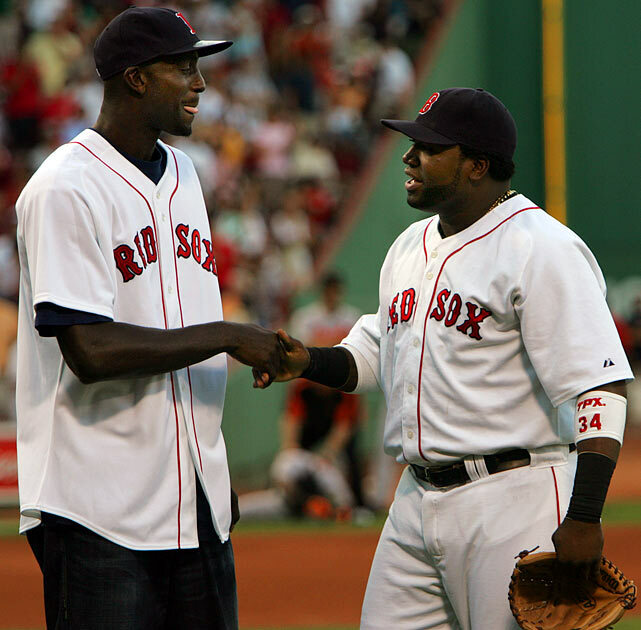 "It's always special to come back to true fans and sort of your foundation," Garnett said in 2012. "But as far as that franchise, I have nothing positive to say." Every passing season brought more return visits, more questions, and no closure. Then, in 2014, Garnett's resentment began to thaw enough that he publicly considered a return—perhaps as an eventual minority owner. One specific factor made it all possible. "I have ties there," Garnett said. "Flip's there." Flip Saunders was the only lasting bridge between Garnett and the Timberwolves. Their bond was strong enough that Saunders convinced the infamous competitor to waive his no-trade clause and return to a team with little chance of winning. It was Saunders who then sold Garnett on returning for two more years and $16.5 million as a champion of internal development for Karl-Anthony Towns, Andrew Wiggins, Ricky Rubio, Zach LaVine, and Gorgui Dieng. Theirs was an agreement made from nearly 20 years of friendship. 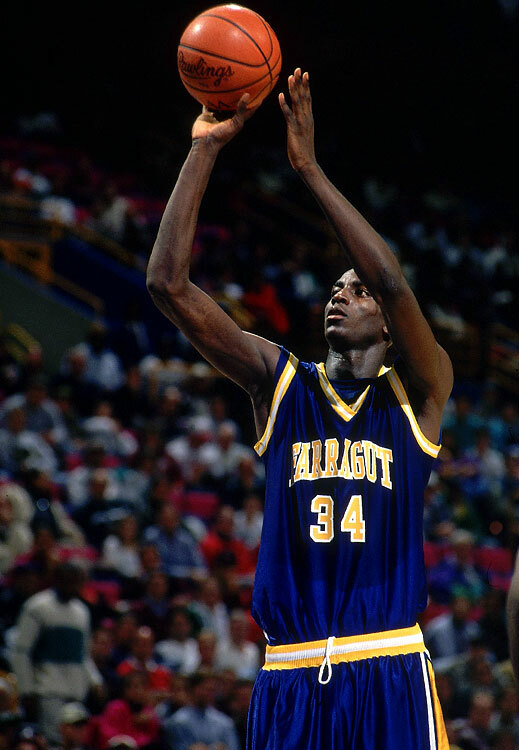 Kevin Garnett starred at Farragut Career Academy in Chicago, where he led the squad to a 28-2 record his senior season and earned National High School Player of the Year honors. 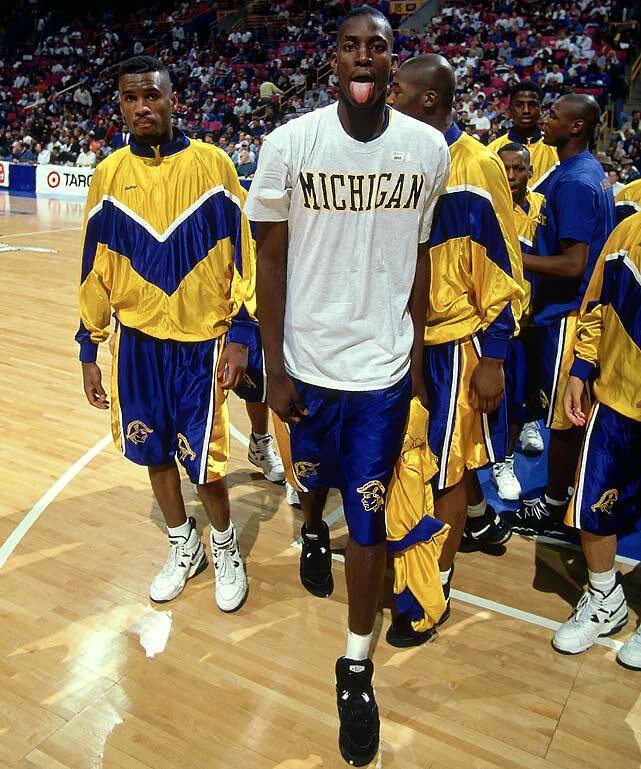 Though the T-shirt may indicate he had dreams of playing in Ann Arbor, he instead chose to enter the NBA straight out of high school. Kevin Garnett was named Mr. Basketball for Illinois after averaging 25 points, 18 rebounds, 7 assists and 7 blocks his senior season at Farragut. 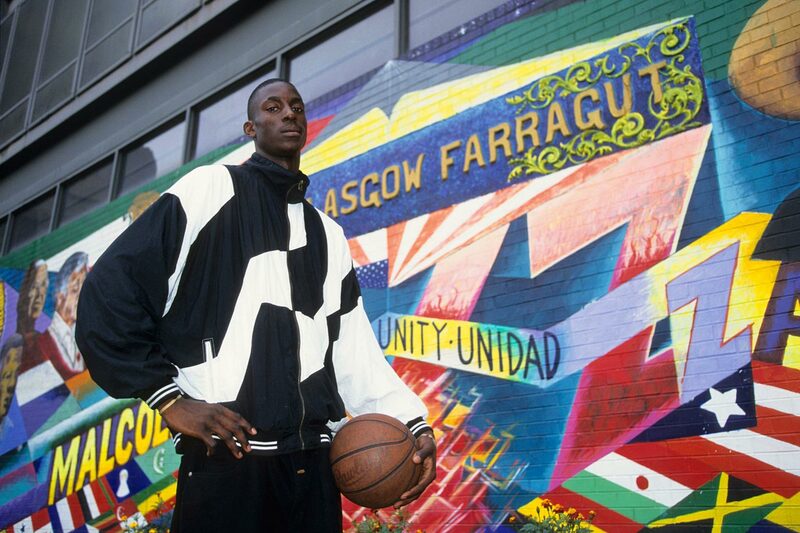 Kevin Garnett poses outside of Farragut Career Academy. KG played for Mauldin High in South Carolina for his first three seasons but transferred to Farragut before his senior year. Kevin Garnett became only the fourth player to jump directly from high school to the NBA, following Moses Malone, Darryl Dawkins and Bill Willoughby. 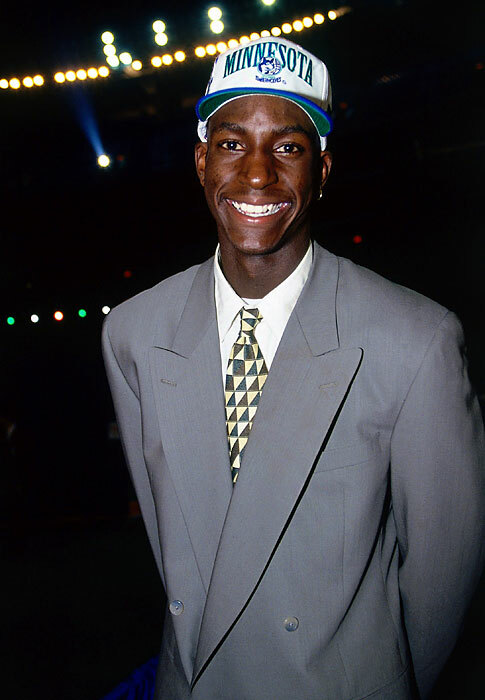 Kevin Garnett was drafted by the Minnesota Timberwolves with the fifth pick of the 1995 NBA Draft. KG was joined in the Top 5 by Joe Smith, Antonio McDyess, Jerry Stackhouse and Rasheed Wallace. 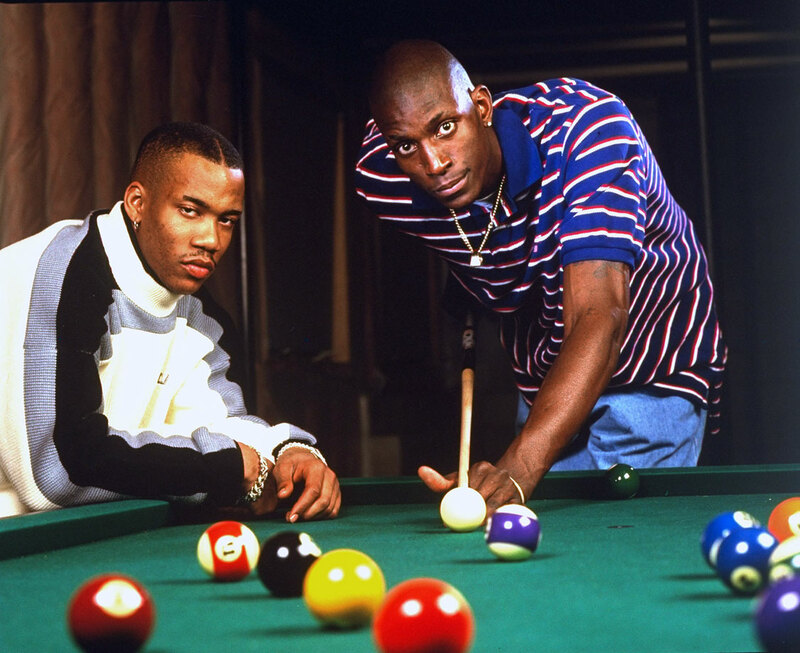 Kevin Garnett was joined the next year by Stephon Marbury and the two were expected to be the future of the organization. 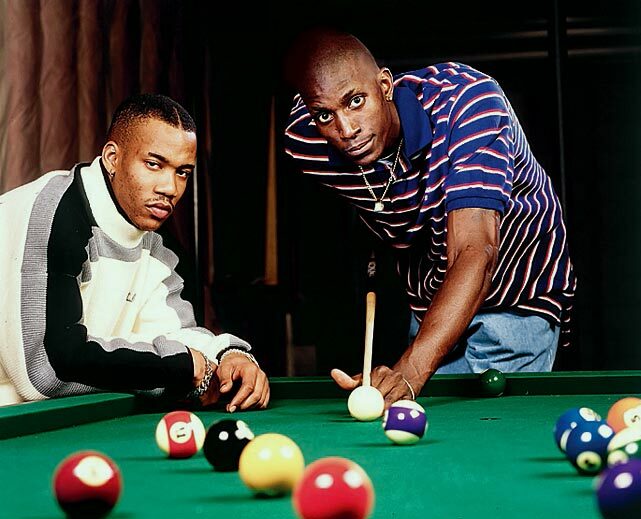 After Kevin Garnett and Stephon Marbury led Minnesota to the playoffs in 1997 and 1998, Marbury was traded to New Jersey after a dispute with management. 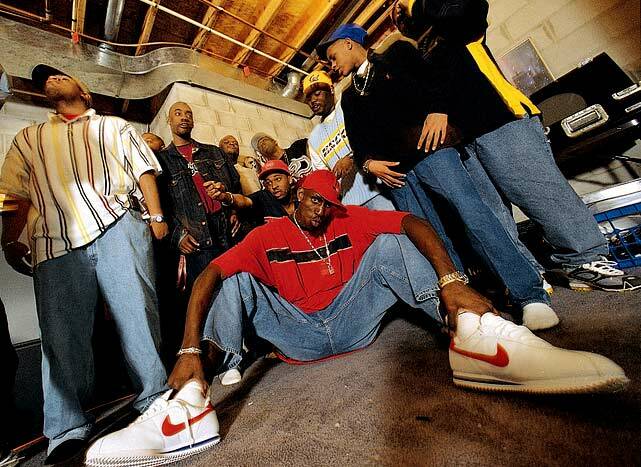 Kevin Garnett's entourage — called the OBF (Official Block Family) — includes friends from Beachwood Drive in his hometown of Mauldin, S.C.
Kevin Garnett strikes a pose. 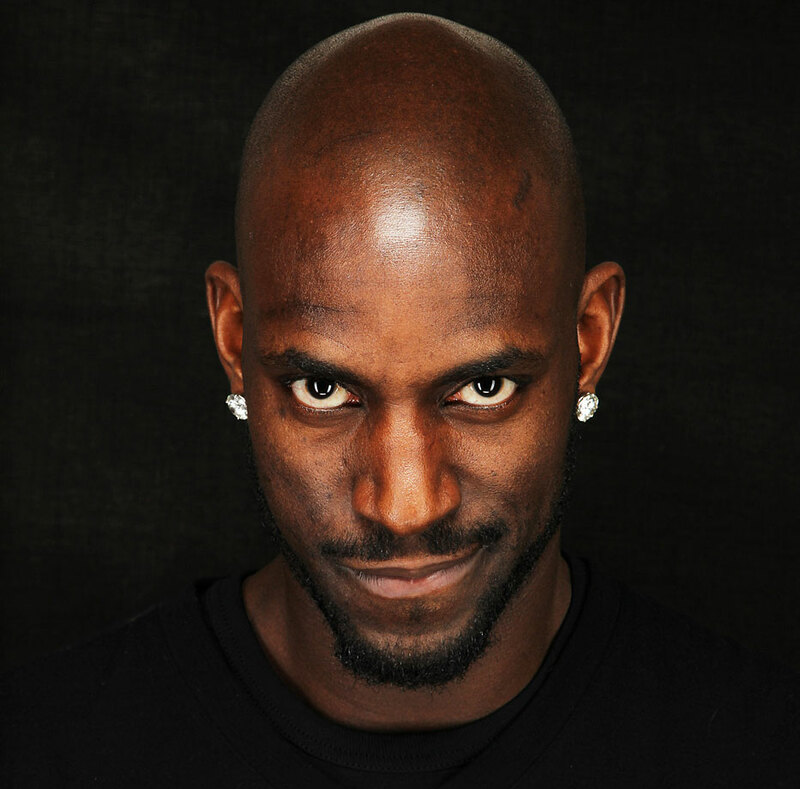 Kevin Garnett in a profile portrait. 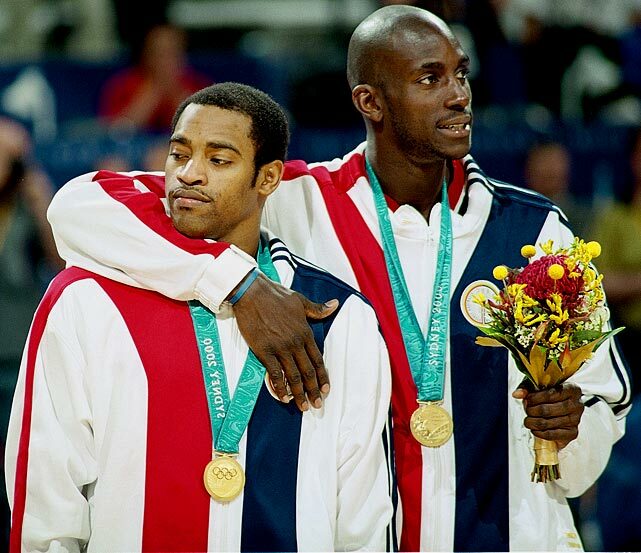 Kevin Garnett puts his arm around Vince Carter after leading Team USA to the gold medal in Sydney. Tim Hardaway, Vince Carter, Kevin Garnett and Ray Allen smile on the floor after leading Team USA to the gold medal in Sydney. 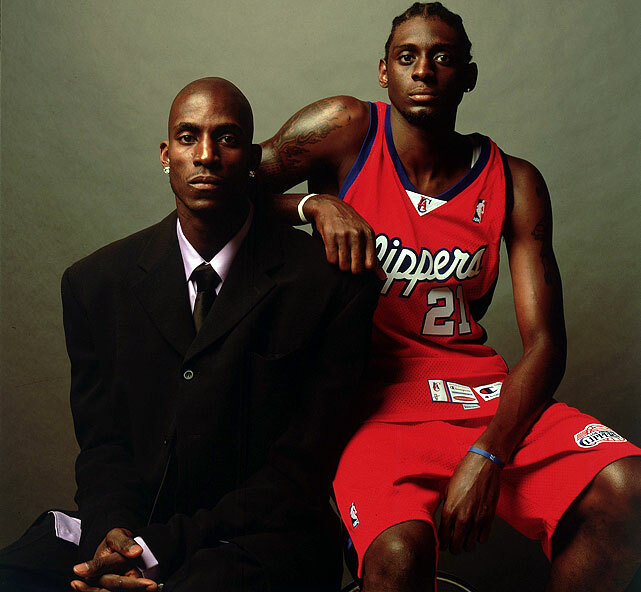 High school star Darius Miles skipped college for the NBA and immediately drew comparisons to Kevin Garnett for their style of play. Those comparisons proved to be incorrect as Miles played nine injury-plagued seasons and is now out of the league. 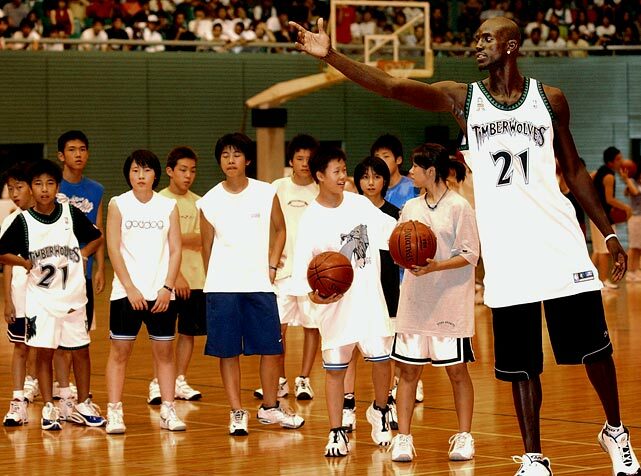 Kevin Garnett shows his skills during an NBA clinic in Tokyo. Kevin Garnett poses with Ludacris during an NBA All-Star Party in Los Angeles. After years of first-round playoff exits, Kevin Garnett was joined by Latrell Sprewell and Sam Cassell for the 2003-04 season. KG was named NBA MVP after averaging 21 points, 12 rebounds and 5 assists. The Timberwolves advanced to the Western Conference Finals before bowing out to the Lakers. 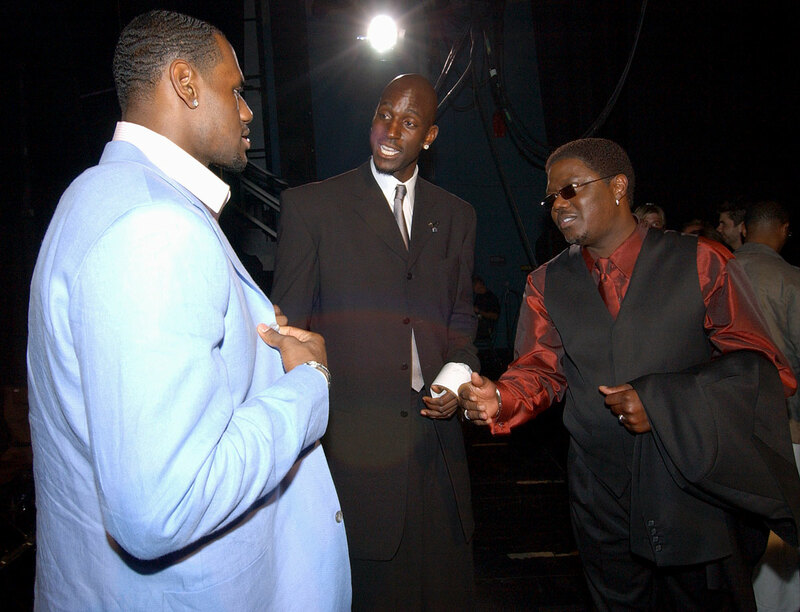 LeBron James, Kevin Garnett and Bernie Mac chat backstage during the 2004 ESPY Awards in Hollywood. 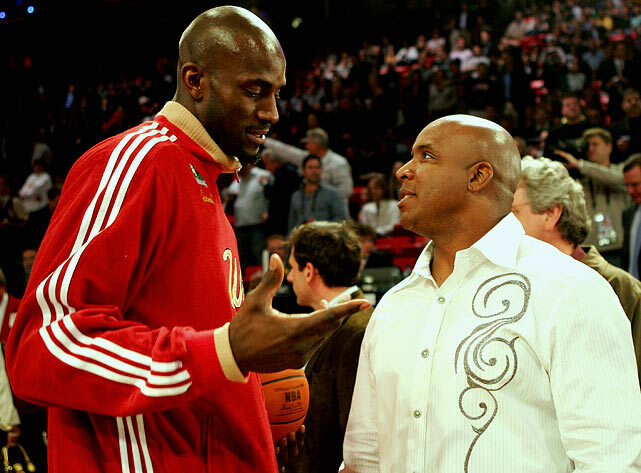 Kevin Garnett chats with Barry Bonds before the 2007 All-Star game in Las Vegas. 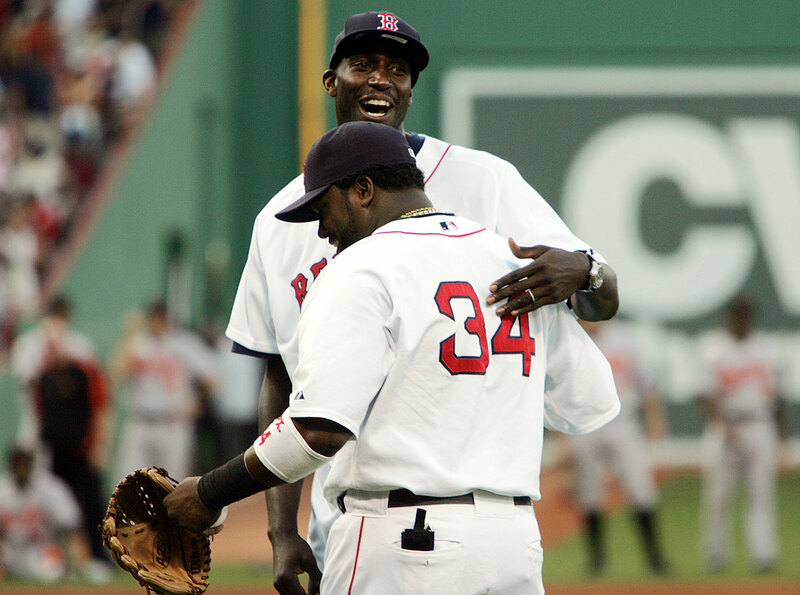 A day after being traded to the Celtics, Kevin Garnett reconnected with his old Minnesota buddy David Ortiz after throwing out the first pitch at Fenway Park. 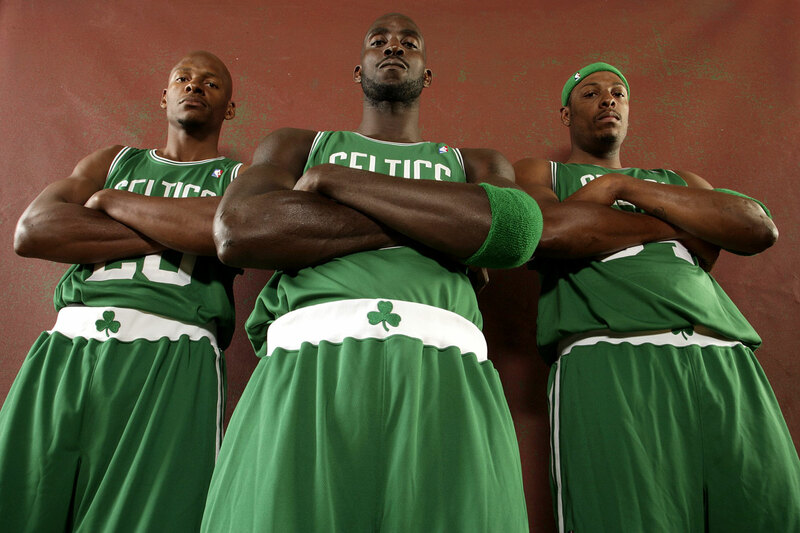 After the trade, Kevin Garnett, Ray Allen and Paul Pierce were immediately dubbed "The New Big Three" in Boston and became one of the favorites to win the 2008 NBA title. Kevin Garnett offers words of encouragement to Serena Williams at the Matt Leinart First Annual Celebrity Bowling Night in Hollywood. Kevin Garnett averaged 20.4 points per game and 10.5 rebounds per game during the 2008 playoffs. 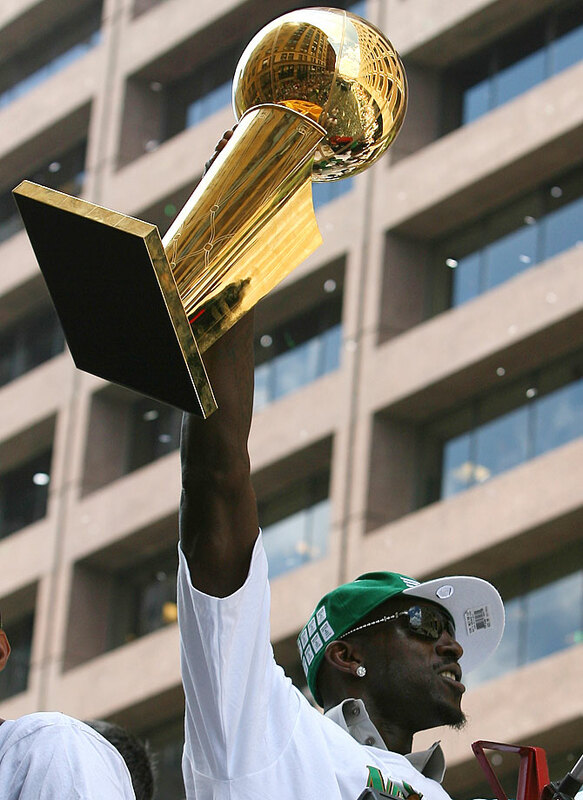 A 15-time All-Star, Garnett finally won his first and only championship in 2008 with the Boston Celtics. 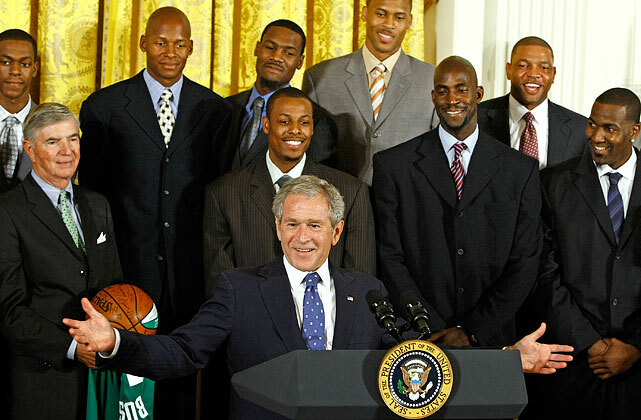 Kevin Garnett and his Celtics teammates meet President George W. Bush after winning the NBA Championship. Kevin Garnett poses with his wife Brandi at the 2008 ESPY Awards. The couple married in 2004, which forced KG to miss a chance to defend the gold medal in Athens. 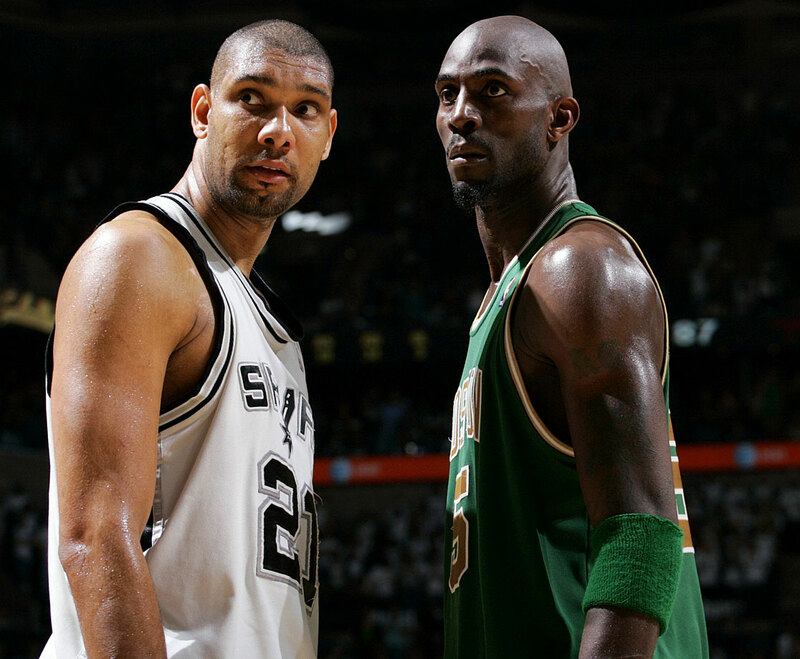 Tim Duncan and Kevin Garnett dominated the power forward position for over a decade. 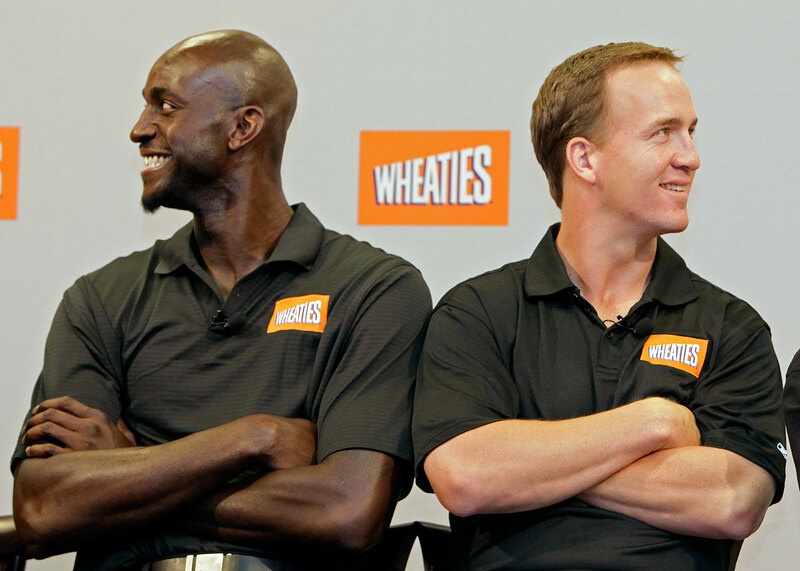 Kevin Garnett poses with then-Indianapolis Colts quarterback Peyton Manning during a promotional press conference for Wheaties. 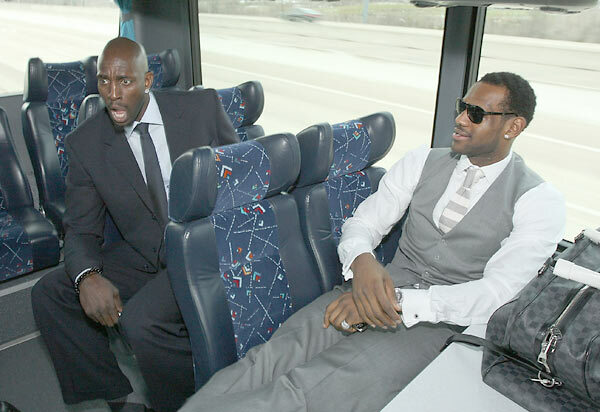 Kevin Garnett and LeBron James share a laugh on the bus ride to the stadium prior to the 2010 NBA All-Star game in Dallas. 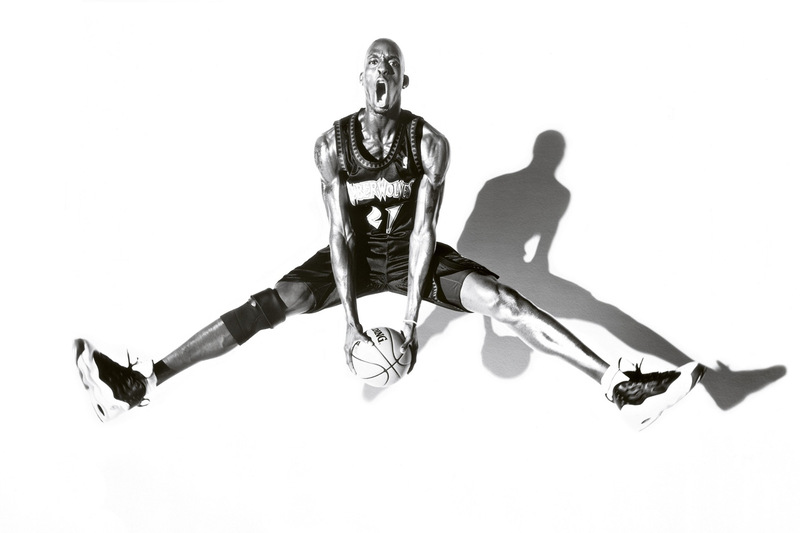 Kevin Garnett poses for a portrait as part of the 2011 NBA All-Star Weekend in Los Angeles. 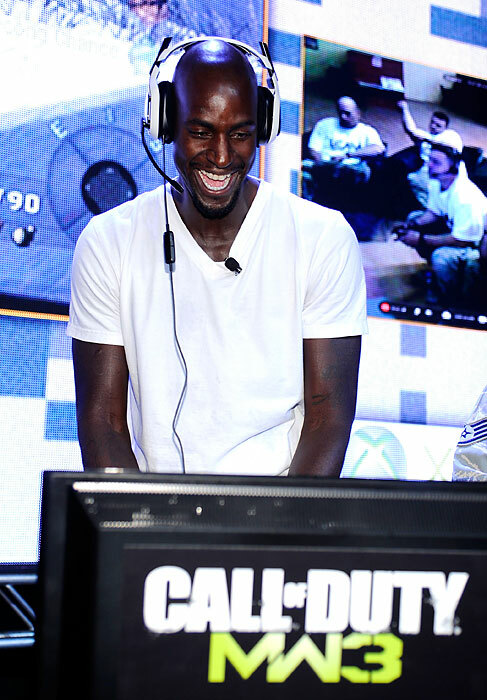 Kevin Garnett battles it out at the first ever Call of Duty XP at the Stages at Playa Vista in Los Angeles. 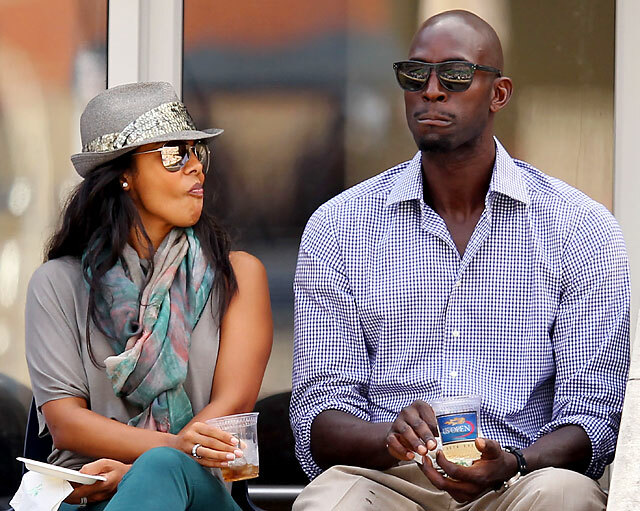 Kevin Garnett and his wife Brandi attend Day 8 of the 2011 U.S. Open. 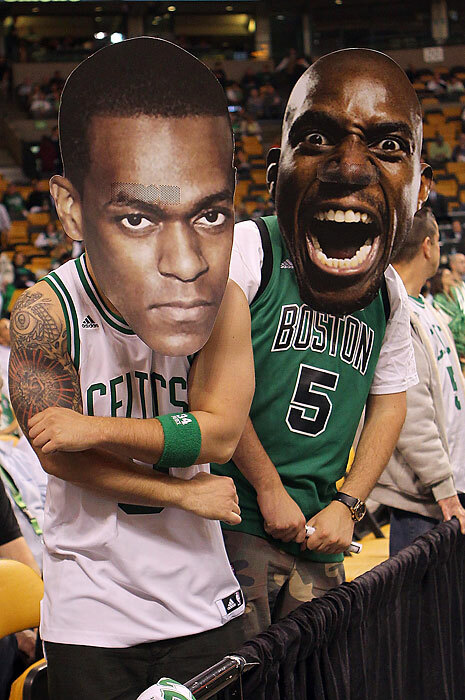 Fans wearing masks of Rajon Rondo and Kevin Garnett pose during Game 6 of the Eastern Conference Finals between the Celtics and Heat in Boston. 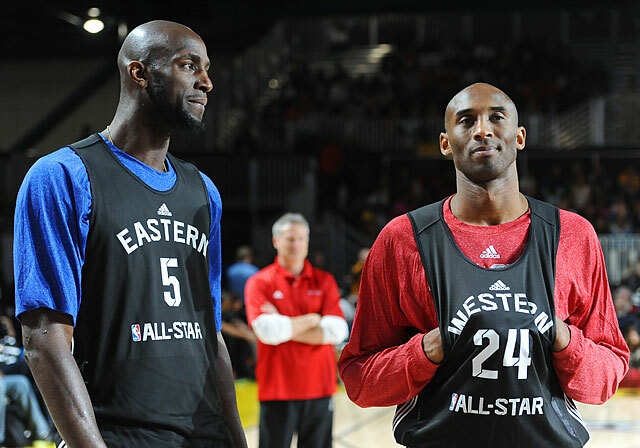 Kevin Garnett and Kobe Bryant talk during the NBA All-Star practice in Houston. Garnett made 12 consecutive All-Star appearances from 2000 to 2011. 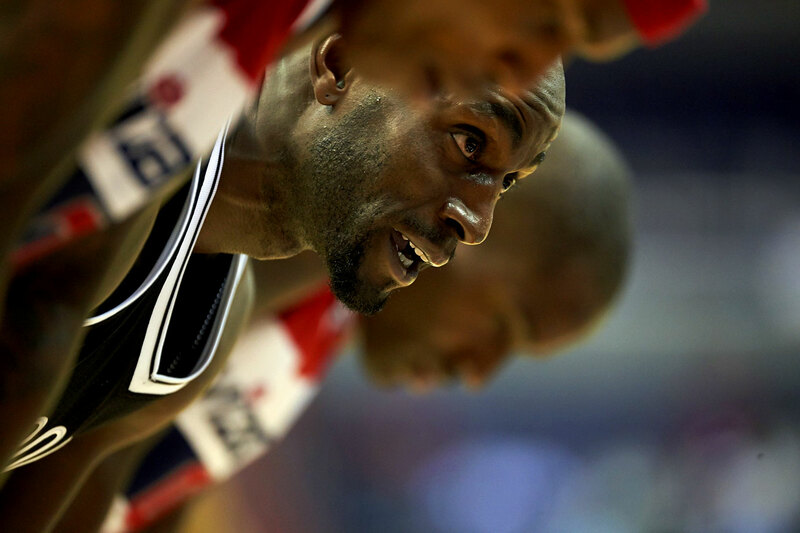 Kevin Garnett looks on during his first preseason game in a Brooklyn Nets uniform. Jay-Z congratulates Kevin Garnett late in the fourth quarter of the Brooklyn Nets 97-83 win over the Toronto Raptors in Game 6 of the Eastern Conference First Round at the Barclays Center in Brooklyn. Eight years after being traded to Boston, Kevin Garnett returned to Minnesota in a trade with Brooklyn for Thaddeus Young. Kevin Garnett throws out the first pitch prior to the Minnesota Twins game against the Kansas City Royals at Target Field in Minneapolis. Kevin Garnett poses with Minnesota Timberwolves rookie Karl-Anthony Towns for an SI cover shoot in Minneapolis. Saunders passed away on October 25, 2015, taken far too early by Hodgkin's lymphoma. A franchise was left in limbo. Everyone that Minnesota had hired had been brought in to work with Flip and every player the Wolves had drafted or signed had been hand-picked by him. Garnett, at long last, had come home. That home was hollowed by Saunders's passing, no matter the mourning and dedications. The Timberwolves even kept Saunders's office in the Timberwolves' practice facility intact. Memory alone could not fill it. This summer has brought Minnesota's first formal attempts to move on. Tom Thibodeau and Scott Layden are the stewards of the franchise now, and with that comes changes across all levels of operations. Sam Mitchell, a friend and former teammate of Garnett's who coached the Wolves last season, was dismissed under regrettable circumstances. Until Friday, Garnett had since kept quiet— even with regard to conveying his intentions for this season to the team, according to Jon Krawczynski of the Associated Press. All that has taken place in the last year (along with Garnett's characteristic resistance to change) pointed to this particular outcome. Injuries limited the 40-year-old legend to just 38 games last season. His presence was of value as a leader and luminary, but KG signed up to work in partnership with Saunders. The bond he shares with Thibodeau, healthy though it may be after working together so swimmingly in Boston, cannot help but be different. Only Garnett can parse just how much that matters—and what it would mean to be a Timberwolf now that his very reason for returning is gone. His gruff voice crackled through the speaker. 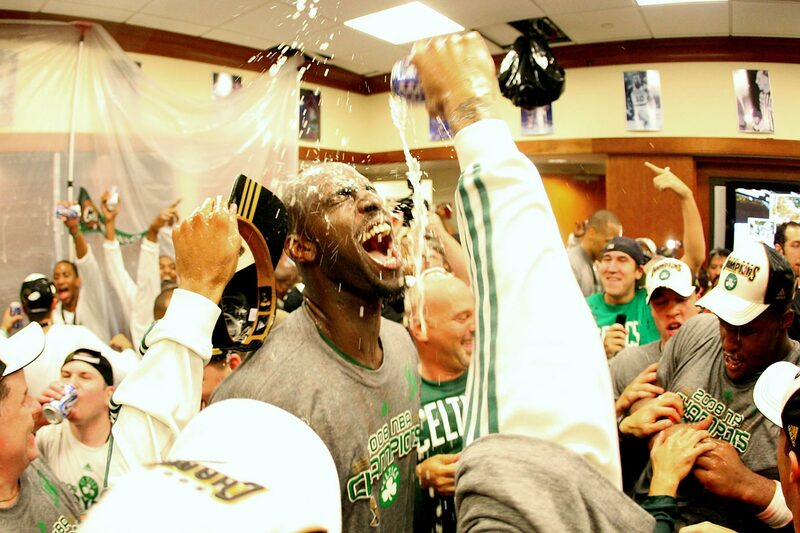 It’s the only phone interview request that Kevin Garnett granted during his 21st NBA season. Later-stage Garnett has developed the media presence of a mangy house cat; mostly disregarding unfamiliar folk trying to tickle his opinionated thoughts while he primarily cuddles up to cozy storylines. Kobe Bryant and Tim Duncan’s retirements warranted responses, but why should a 40-year-old, world champion, league MVP get tangled in discussing the minutiae of each game, each practice? He frequently changed his cell phone number to avoid unprompted calls. He enjoyed prolonged soaks in the shower to escape postgame media availability. This, however, was a special exception. 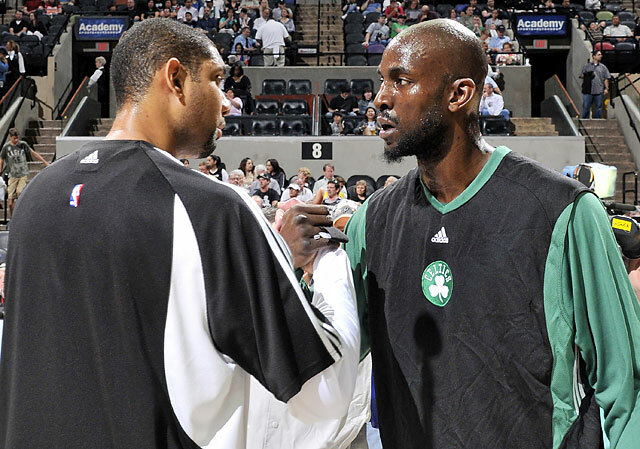 “Anything for Perk, man,” Garnett says in April of his final NBA season after announcing his retirement Friday. After Minnesota narrowly emerged victorious, the two towering brutes sought each other outside the Target Center locker rooms. They had to be separated. “There wasn’t any physical altercation, but there was some verbal altercation between the two,” says longtime Celtics assistant Jamie Young. Perkins’s barking still rang in Garnett’s ears when Minnesota and Boston discussed their blockbuster trade on draft night that June. The Celtics remained firm: Boston would only exchange the promising Al Jefferson and a hoard of other assets if Garnett agreed to a contract extension. On the other line, Garnett smiled that toothy, often sadistic smile. He always relished battling younger players, channeling the competition as fuel. “When you’re older and the big dog, you got little pups and stuff wanting to come at you night in and night out,” Garnett says. The true motivation for Perkins’s physicality passed Garnett’s first test, although the frontcourt duo’s first day in Boston was still tense. “He was still trying to feel me out, see if he liked me or not, if I liked him,” Perkins says. Unbeknownst to the youngster, Garnett was still evaluating Perkins’s potential as a pupil. KG starred at Farragut Career Academy in Chicago, where he led the squad to a 28-2 record his senior season and earned National High School Player of the Year honors. Though the T-shirt may indicate he had dreams of playing in Ann Arbor, he instead chose to enter the NBA straight out of high school. Garnett poses outside of Farragut Career Academy. KG played for Mauldin High in South Carolina for his first three seasons but transferred to Farragut before his senior year. Garnett was named Mr. Basketball for Illinois after averaging 25 points, 18 rebounds, 7 assists and 7 blocks his senior season at Farragut. 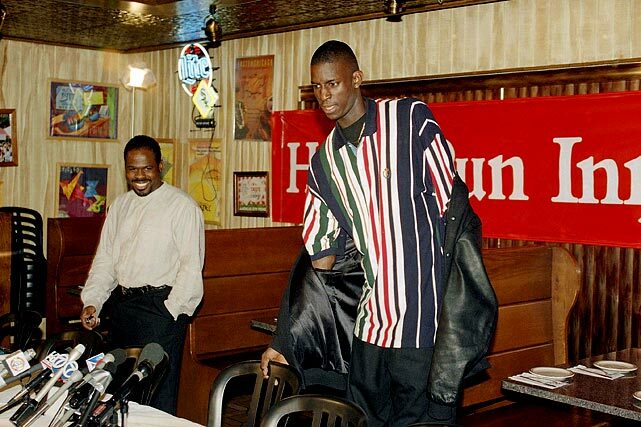 Garnett and his Farragut Academy coach, William Nelson, arrive at a news conference to announce Garnett's intention of skipping college to jump directly to the NBA. Garnett became only the fourth player to jump directly from high school to the NBA, following Moses Malone, Darryl Dawkins and Bill Willoughby. 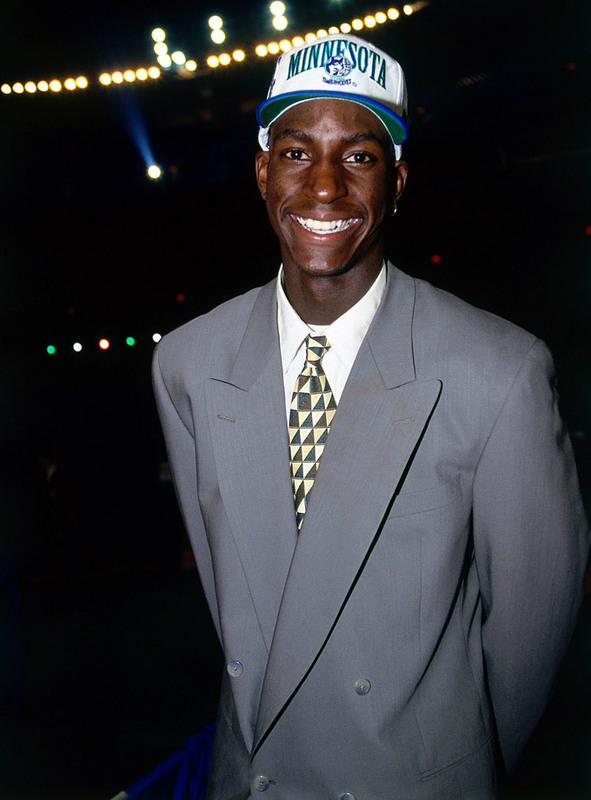 Garnett was drafted by the Minnesota Timberwolves with the fifth pick of the 1995 NBA Draft. KG was joined in the Top 5 by Joe Smith, Antonio McDyess, Jerry Stackhouse and Rasheed Wallace. Garnett was joined the next year by Stephon Marbury and the two were expected to be the future of the organization. After leading Minnesota to the playoffs in 1997 and 1998, Marbury was traded to New Jersey after a dispute with management. 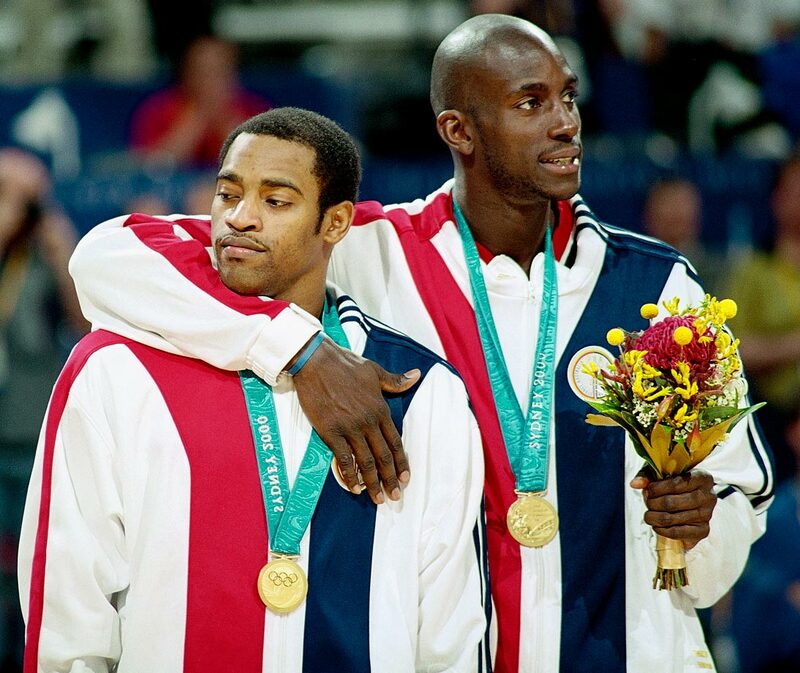 Garnett's entourage -- called the OBF (Official Block Family) -- includes friends from Beachwood Drive in his hometown of Mauldin, S.C.
Garnett puts his arm around Vince Carter after leading Team USA to the gold medal in Sydney. 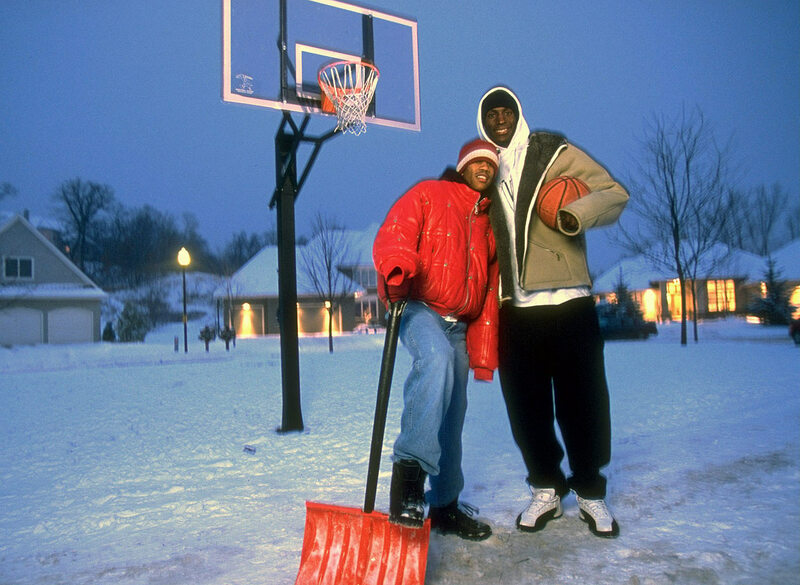 In 2000, high school star Darius Miles skipped college for the NBA and immediately drew comparisons to Garnett for their style of play. Those comparisons proved to be incorrect as Miles played nine injury-plagued seasons and is now out of the league. Garnett shows his skills during an NBA clinic in Tokyo. 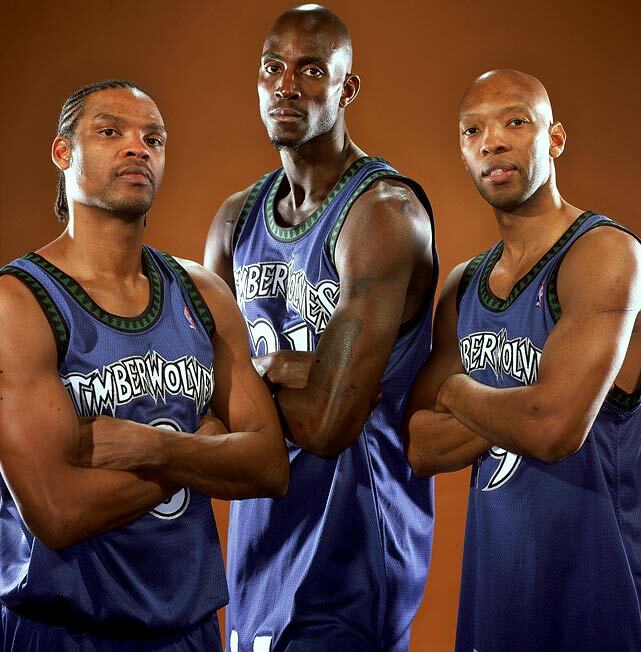 After years of first-round playoff exits, Garnett was joined by Latrell Sprewell and Sam Cassell for the 2003-04 season. KG was named NBA MVP after averaging 21 points, 12 rebounds and 5 assists. The Timberwolves advanced to the Western Conference Finals before bowing out to the Lakers. Garnett offers words of encouragement to Serena Williams at the Matt Leinart First Annual Celebrity Bowling Night in Hollywood. 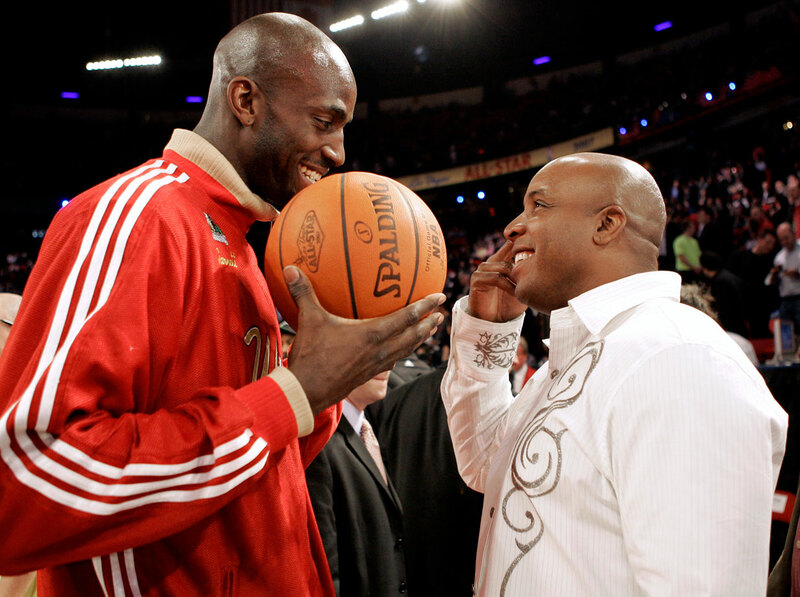 Garnett chats with Barry Bonds before the 2007 All-Star game in Las Vegas. 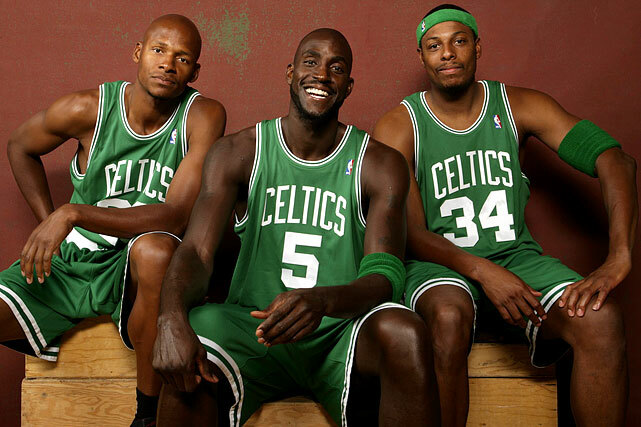 After the trade, Garnett, Ray Allen and Paul Pierce were immediately dubbed "The New Big Three" in Boston and became one of the favorites to win the 2008 NBA title. Garnett poses with his wife, Brandi. The couple married in 2004, which forced KG to miss a chance to defend the gold medal in Athens. 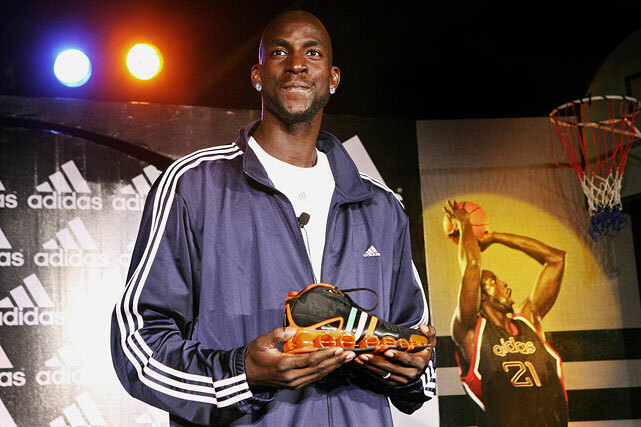 Garnett averaged 20.4 points per game and 10.5 rebounds per game during the 2008 playoffs. 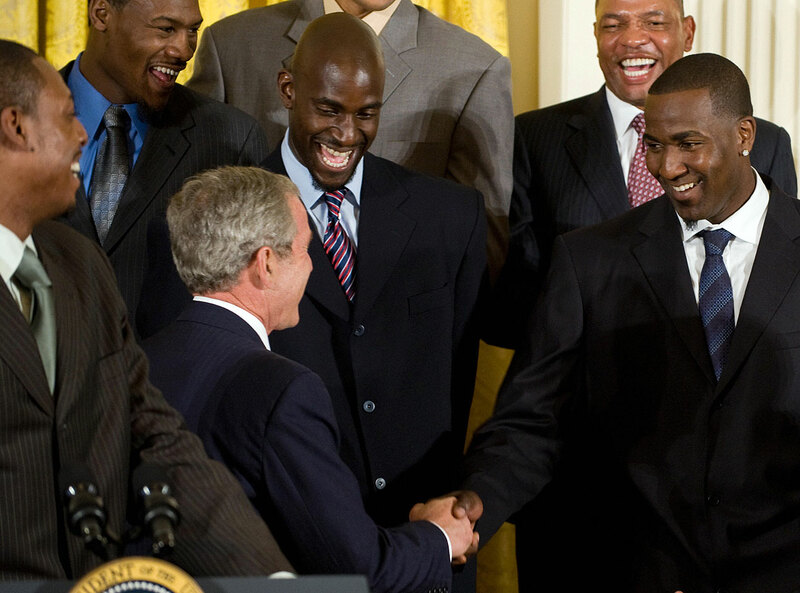 Garnett and his Celtics teammates meet President George W. Bush after winning the NBA Championship. 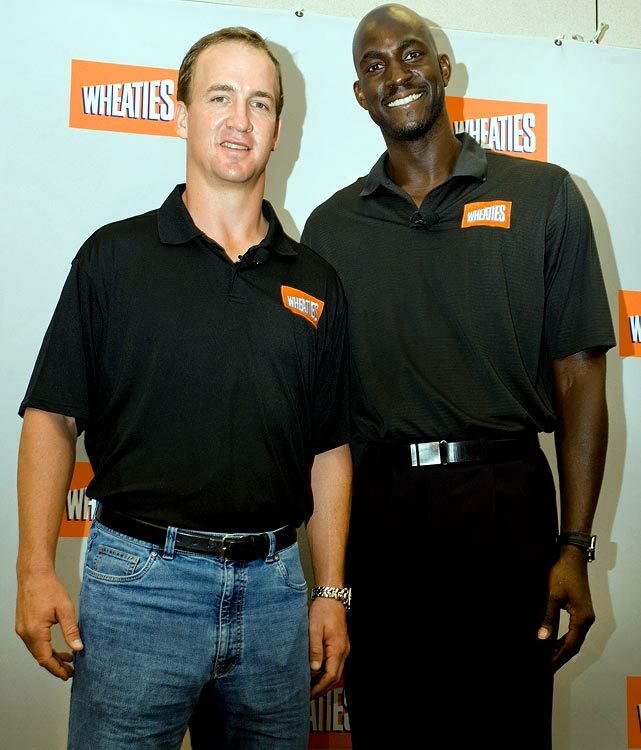 Garnett poses with then-Indianapolis Colts quarterback Peyton Manning during a promotional press conference for Wheaties. Tim Duncan (left) and Garnett shake hands before a game between the Celtics and Spurs. Garnett and Duncan have dominated the power forward position over the past decade and a half. 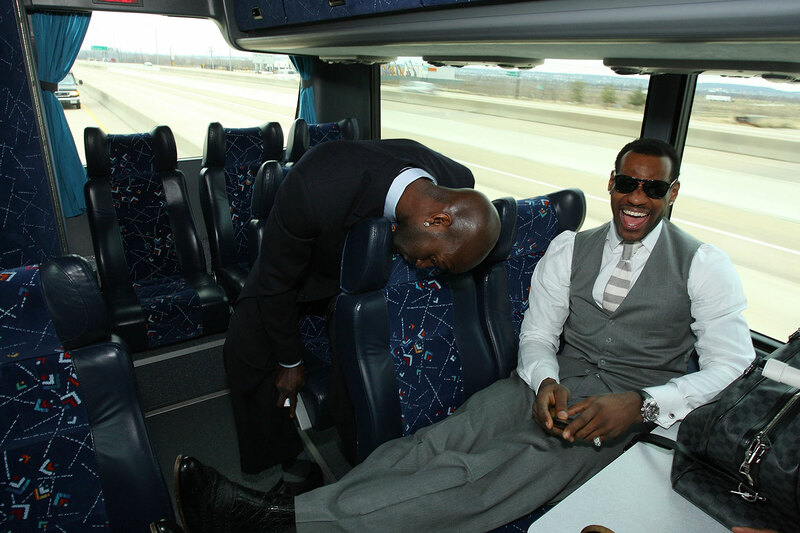 Garnett and LeBron James share a laugh on the bus ride to the stadium prior to the 2010 NBA All-Star game in Dallas. 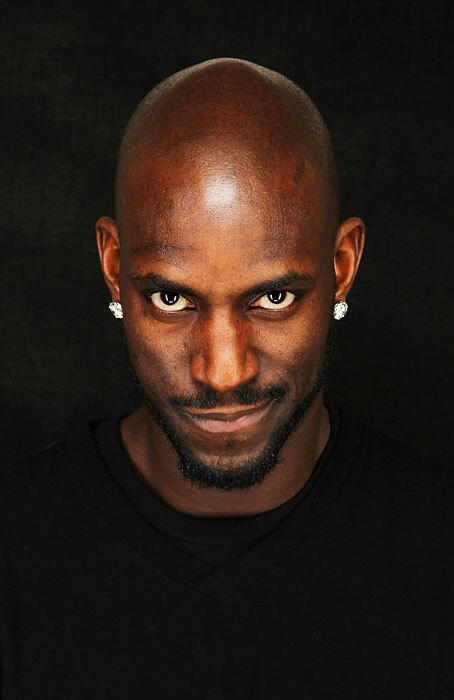 Garnett poses for a portrait as part of the 2011 NBA All-Star Weekend in Los Angeles. 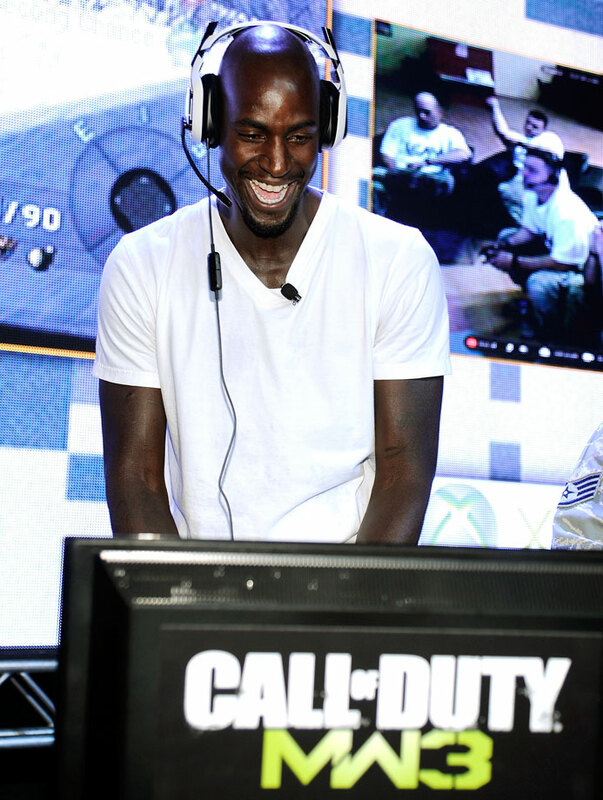 Garnett battles it out at the first ever Call of Duty XP at the Stages at Playa Vista in Los Angeles. Garnett and his wife, Brandi, attend Day 11 of the 2011 U.S. Open. 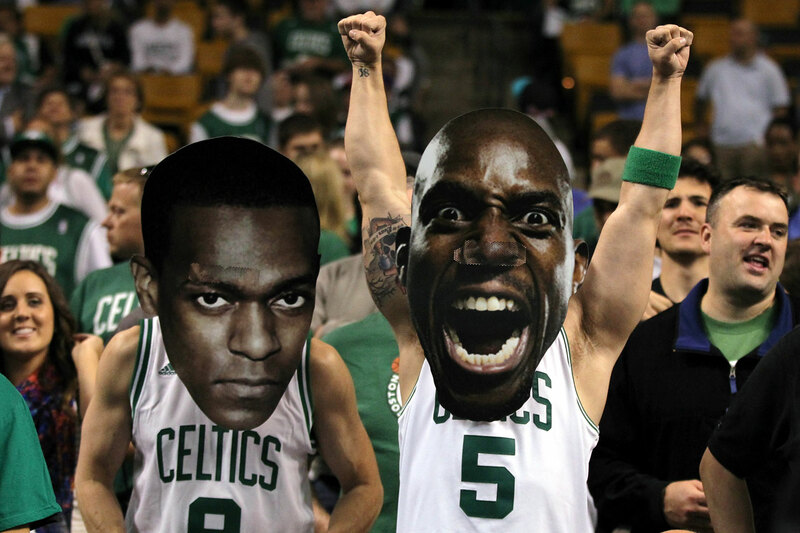 Fans wearing masks of guard Rajon Rondo and Garnett pose before a game with the Atlanta Hawks in Game 3 of the Eastern Conference quarterfinals. 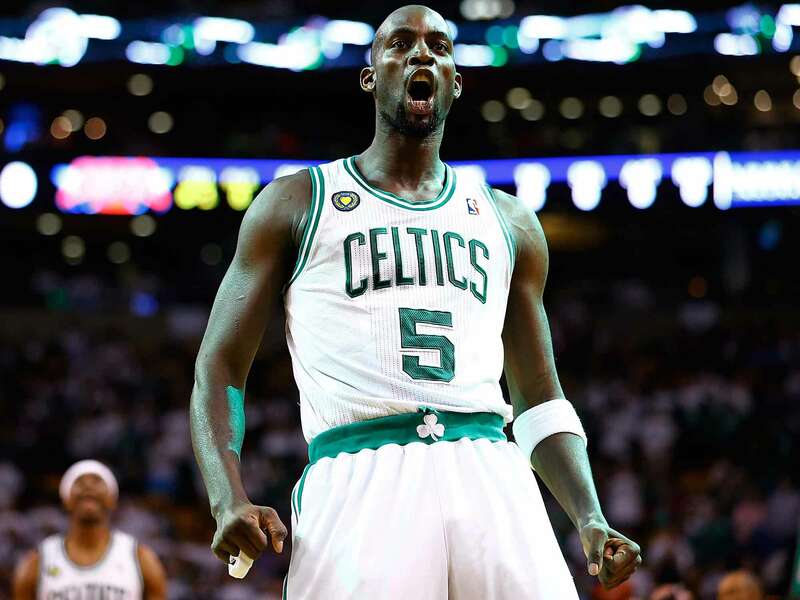 Garnett has adopted the city of Boston as his home since his arrival in 2007 and has become a favorite among the Celtics faithful. 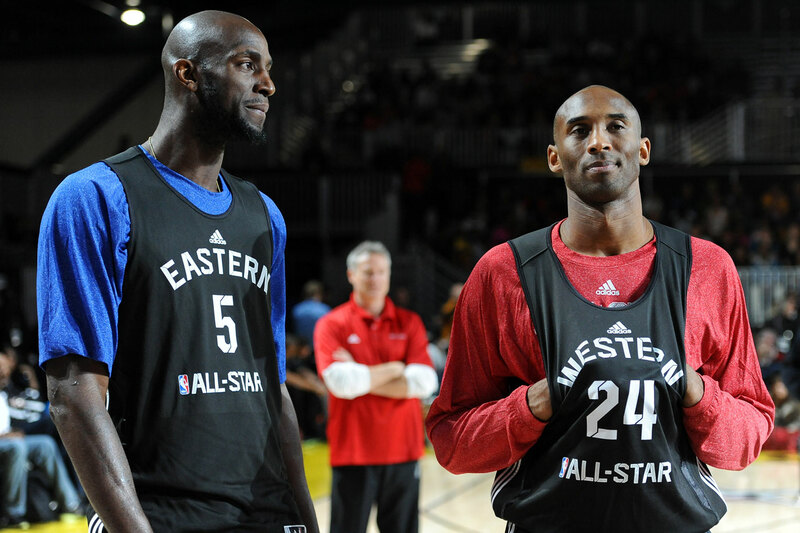 Kobe Bryant (right) and Garnett talk during the NBA All-Star practice in Houston. Garnett made 12 consecutive All-Star appearances from 2000 to 2011. Rivers remembers his defensive anchors constantly buzzing over rotations and close-outs and pick-and-roll coverages in the locker room before games and even while one sat on the bench while the other manned the paint. While many teams implemented a static defense for high ball-screen actions, Boston allowed Garnett and Perkins to evaluate each opponent on their own. “They believed the five and the four held down the fort and they talked it up in shootaround and in practice and it was pretty interesting,” Rivers says. During the team’s very first practice that fall, Rivers had to whistle live ball action dead on multiple occasions as Perkins matched Garnett’s deafening roars at the second unit. 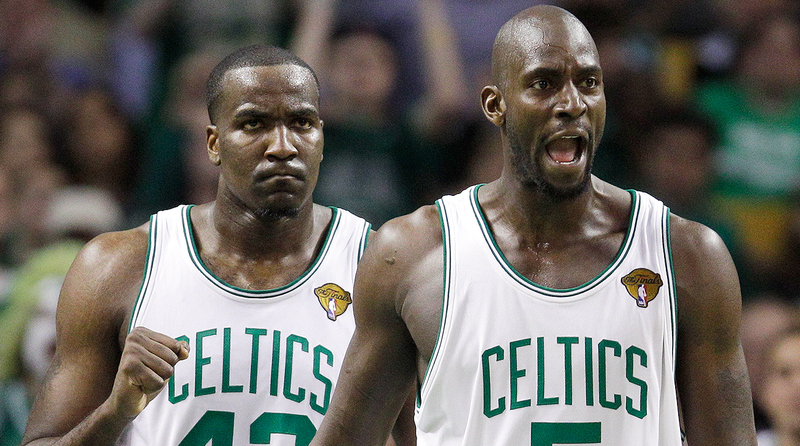 “I don’t think it took Perk very long at all before he had KG’s respect,” Celtics general manager Danny Ainge says. A big brother-little brother relationship quickly spawned. Perkins embraced his apprenticeship. “I just followed him, I observed him, I watched a future Hall of Famer,” he says. “I watched how he worked, I watched how he operated, I watched his leadership skills.” Perkins mimicked Garnett’s moves in the post. He started arriving at the practice facility earlier, changed his eating habits and, in turn, dropped weight. “He started emulating what KG was,” says Allen. With Boston’s “Big Three” of Garnett, Pierce and Allen, complemented by Perkins and point guard Rajon Rondo, the Celtics raced out to a 29–3 start in 2007–08 and firmly grasped first place in the Eastern Conference throughout the regular season. After opening round playoff battles with the Atlanta Hawks and Cleveland Cavaliers, the Celtics captured the franchise’s 17th championship in six games over their rival Los Angeles Lakers. 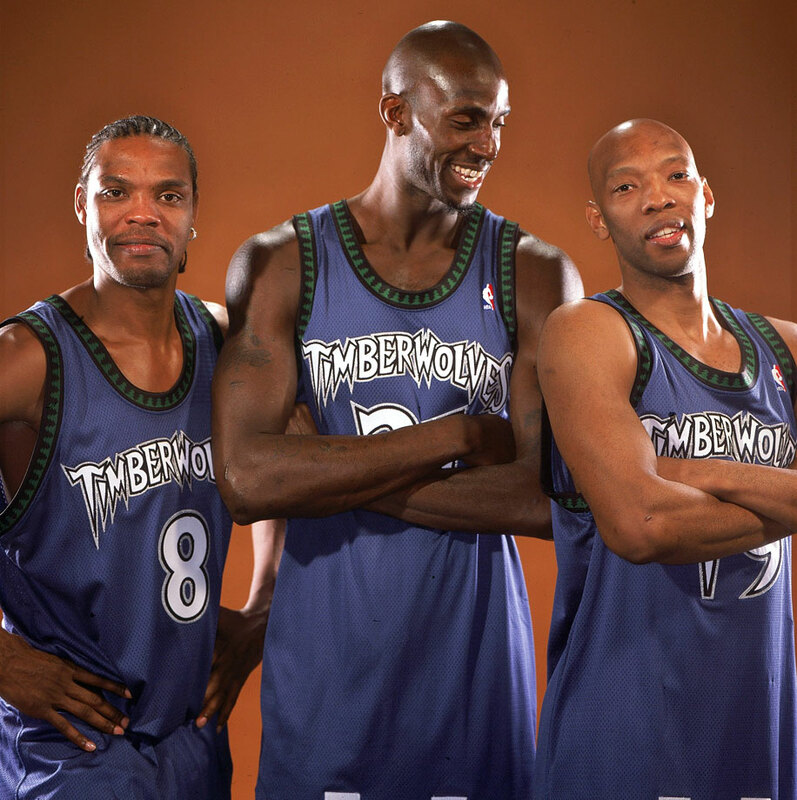 Garnett announced his retirement on Friday, likely to fade into obscurity just as the Timberwolves re-ascend on the broad shoulders of another generationally gifted, young 7-footer. If Kendrick Perkins’s development is any indication, Karl-Anthony Towns is destined to defensively stalk the paint for the next decade with a snarl, revving a perpetual motor his teammates will only attempt to equal and Garnett’s pawprints covering his fated accolades. 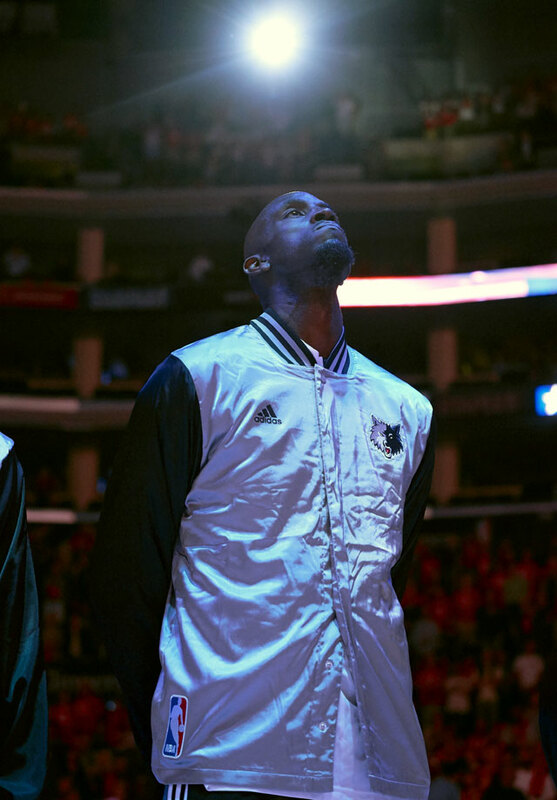 Kevin Garnett, who announced his retirement on Friday, won’t ever be forgotten. He had spectacular playing career, scoring over 1,400 points and making 15 All-tar teams, and was also one of the most outspoken and physical players in league history. During his time in the NBA, Garnett started many on-court shoving matches, scuffles and a few brawls. In honor of his retirement, we’re taking a look back at the five most memorable times he was thrown out of a game, from smacking a basketball, to clocking Tyler Hansbrough across the face. Enjoy these, then go re-live the top moments in his career. Hard to top that one.